Kortendick's staff brings its experience in irrigation design, installation, and maintenance to every irrigation project. 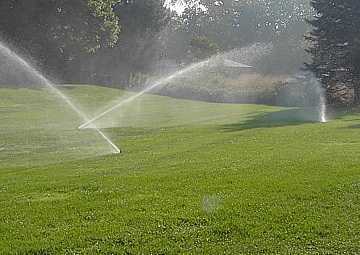 We will custom design your sprinkler system using the latest products from Toro, Rainbird, Hunter, Netafim and more! 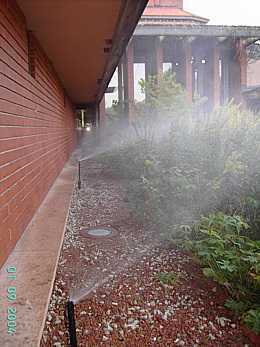 Save water, time and effort with an automatic sprinkler system. Conserving precious water is everyone's responsibility. But that shouldn't mean sacrificing your green lawn and beautiful landscaping! An efficient, automatic sprinkler system will conserve water and probably reduce your water bill. A new sprinkler system from Kortendick Underground Irrigation Systems will turn itself on and off automatically, definitely saving you time and effort!, while giving you more free time for your favorite activities. Kortendick's team of irrigation experts has more than 30 years experience and brings its experience in design, installation, and maintenance to every irrigation project in southeastern Wisconsin, from Milwaukee to Waterford to New Berlin, Oak Creek and Racine ... and everywhere in between! We will custom design your sprinkler system using the latest products from Toro Residential Irrigation & Sprinklers, Rain Bird SprinklerSystems, Hunter Irrigation Systems, Netafim Drip/Micro Irrigation Products and more! Why drag a cumbersome garden hose all over your yard? Why wait for enough (or too little) water to be applied? Why worry about watering while you're away? A professionally designed and installed irrigation and sprinkler system will efficiently manage water consumption while providing the correct amount of moisture for healthy plants, tress and turf. An automatic irrigation system saves time and money by reducing plant loss and the amount of labor required to keep your landscape thriving and perfectly maintained! Enhance your home's value. An underground irrigation system adds to both the beauty and value of your home, and is a great benefit to your landscape. Contact us for a FREE estimate! Page Summary: Kortendick Underground Irrigation Systems installs irrigation system, lawn sprinklers and garden sprinklers in Racine, Milwaukee and Waukesha, Wisconsin. As one of the BEST irrigation companies in Southeast Wisconsin, we also provide sprinkler repair, irrigation supplies and garden irrigation for Oak Creek, West Bend and New Berlin in Dane County. Our sprinkler systems repair extends to automatic watering systems in Kenosha, Burlington, and Brookfield, as well as Waterford and surrounding Racine County, WI communities. Copyright © 2014-2019, Kortendick Underground Irrigation Systems - All rights reserved.